There’s no better time to plan a trip to sunny San Diego because the American Association of Equine Practitioners (AAEP) is hosting its ninth annual Healthy Horses Workshop, to be held Dec. 6 in America’s Finest City. The event offers seminars addressing health topics important to horse owners and features world-renowned veterinary experts. As a special treat, eventing’s Olympic silver medalist Gina Miles will be on hand at the workshop to talk about her Olympic experience. —Eye Diseases for Horse Owners: No More Blind Horses! The Workshop takes place from 8 a.m. to 5:30 p.m. at San Diego’s Manchester Grand Hyatt Hotel in conjunction with the AAEP 54th Annual Convention. The pre-registration fee through November 10 is $70; on-site registration is $85. Lunch is included with the cost of registration. 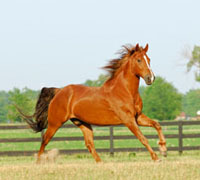 To register, visit www.aaep.org/healthy_horses.htm. You also may register for this event by calling the AAEP office at (800) 443-0177. Seating is limited and on-site registration will be offered based on space availability. that would be interesting to go to. I really think they should talk about lamenes..I deal with it with my horse,and so do numerous other horse owners. Sounds fun but too far away.